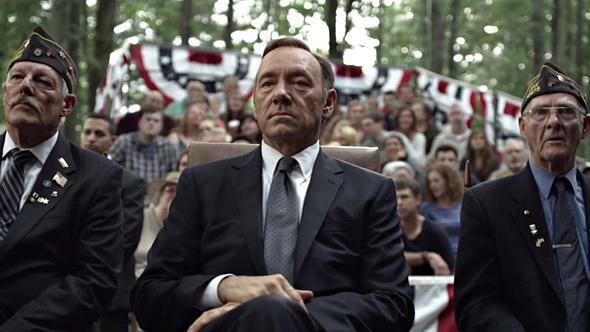 Is binge watching the new season of House of Cards bad for you? It’s a thoughtful, smart way to enjoy the new House of Cards season. During a recent family gathering, I watched my children and nephew play Mario Kart. It was chaotic and overwhelming, a riot of noisy Japanese anime characters hurtling around cartoon racetracks. Observing the scene was enlightening because my wife and I play Mario Kart nightly. With a controller in my hands, all the blinky distractions drop away, and my attention narrows to my character, my opponents, and the course. Feeling my mind shift into a state of effortless concentration is a big part of the pleasure of gaming. Watching is frantic. Playing is focused. We’re fascinated with the effects digital and interactive media have on us, and with good reason. What we often overlook is that they don’t affect us in linear, mechanical ways. Previous experience, context, and intention all affect the way they influence us. Take binge watching, the practice of watching multiple episodes of a television series back-to-back. The term binge suggests overindulgence or out-of-control behavior. One-quarter of respondents in a December 2013 Harris Interactive admitted they’d watched an entire 13-hour season of a series in two days, raising specters of glassy-eyed adults, misused sick days, and neglected pets. But to me, the experience of binge watching Lost, Breaking Bad, and Avatar: The Last Airbender has always felt more complicated. Recently, I’ve been interviewing other binge watchers about their habits and practices. There may be people who turn off their brains and watch eight straight hours of Jersey Shore, but for this group, binge watching isn’t mindless recreation. It’s a restorative experience. It’s strategic and methodically organized, a protest against technology-enabled mindlessness. It’s a way to reclaim their time and attention in a rushing, distracting world. So go ahead, watching Season 2 of House of Cards when Netflix releases it on Friday. The term “restorative experiences” was coined by University of Michigan psychologist Stephen Kaplan. He wanted to understand why walks in the park, or even looking at a picture of a landscape, can recharge your mental batteries. Restorative experiences, he found, share a few common features. They’re fascinating: Unlike a conference call or spreadsheet, they hold your attention without effort. They provide a sense of transporting you from your normal life and environment. They strike a balance between complexity and compatibility: They’re rich and fully realized worlds, but you can make sense of them. Natural environments like parks and beaches, and built spaces like churches and gardens, can be restorative. So can the theater or good books. It’s not obvious at first sight, but binge watching has all the features of restorative experiences. My interview subjects declare a strong preference for “compelling,” “critically acclaimed,” and “engrossing” series. Often they’re based on books (Game of Thrones, Sherlock). They feature complicated plots that unspool over the course of a season (24, Lost), great characters and acting (The Sopranos, House of Cards), and well-developed worlds (The Wire’s inner-city Baltimore, the royal court of The Tudors). In other words, they’re choosing series that are fascinating, complex, and compatible. Some critics have worried that the decline of synchronized TV watching impoverishes of our common culture (an argument that must have Mortimer “Great Books” Adler and Allan “Closing of the American Mind” Bloom spinning in their graves). Again, the reality is more complex: Binge watching is social, but in different ways than live TV. Viewers rely heavily on word of mouth when choosing series. This helps guarantee quality—one philosophy professor and Game of Thrones fan waited “until a few episodes had already come out and praise was running high” before diving in—and it helps viewers understand cultural references and inside jokes. “Knowing I’ll have something to talk about with [friends] when I’m done” affected his decision to binge-watch Parks and Rec, one software developer told me. It doesn’t support water cooler talk about last night’s episode, but it does encourage talk about characters and story arcs. If binge watching supports conversation, it discourages real-time chat. This is a feature, not a bug. Binge watchers are free from the pressure to be always on and constantly commenting: Nobody live-tweets their reactions to the 1996 season of The X-Files. Just as romance readers can use books to carve out private space (“not now, dear, Mommy’s reading”), binge watching lets people focus on one thing for hours rather than seconds or minutes. In an era where “little ‘invisible’ chunks” of time on Snapchat and YouTube can easily absorb as much time in a week as a season of Breaking Bad, the ability to reclaim control of one’s time, to rediscover—as Shay Colson, a Seattle-based cybersecurity engineer I quote in my recent book put it—“how much time is in the day when you don’t spend it in 30-second chunks,” makes binge watching an almost radical act of self-determined focus. Of course, the people I’m talking to may be exceptional. They’re highly educated, thoughtful by training and inclination, and their busy lives force them to be careful with their time. For people with less self-discipline and fewer demands on their time, binge watching may be mindless rather than restorative. But small groups often pioneer ways of using technology that eventually become mainstream. And if media companies like Netflix and Hulu pay attention to them, and choose to design for more mindful viewing, it’ll show the industry that it’s possible to make money without trying to appeal to unconscious habits, or turn users into dopamine addicts. In an era in which distraction has become a business plan, that would be a truly disruptive innovation. Related: A Slate/SurveyMonkey poll reveals how people like to do their binge-watching.